Vanuatu - ‘the land eternal’ - is everything you could want from a South Pacific escape and more. Sunshine, sand and sea; vibrant cities and traditional villages to explore; and inviting locals who quickly find a place in your heart… the only thing missing from this tropical paradise is you. Experience the laid-back island charm of Vanuatu for yourself with six nights at Poppy’s on the Lagoon Resort on Efate Island - recently voted among the top 10 South Pacific resorts by ‘Holiday with Kids’. Situated on the edge of Erakor Lagoon, just 15 minutes from downtown Port Vila, Poppy's strikes the perfect balance between barefoot relaxation and exploration. Package includes return flights, six nights accommodation, daily breakfast and more. Want to bring the rest of the family along? Options are also available for two adults and one child, two adults and two children, and three or four adults - all including return international flights! Located high in the resort, each of these beautifully appointed studios enjoys stunning views of Erakor Lagoon and feature louvered windows to take advantage of cooling breezes. These bungalows are self-contained and feature a private indoor spa and balcony only five metres from Erakor Lagoon's waters edge. 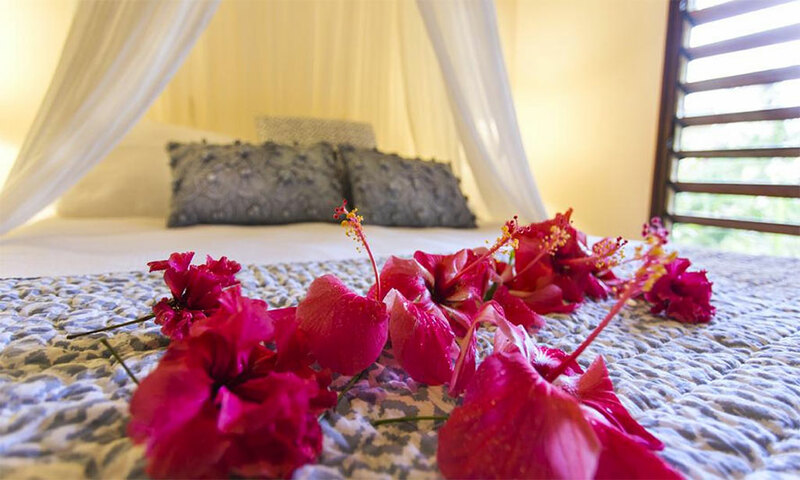 Perfect for couples wanting a little more privacy or simply those who like to have the best, the bungalows are luxuriously furnished with island décor and feature traditional canopy nets over the queen beds. Please note: Children under 16 years of age cannot stay in the Beachfront Spa Bungalows (adults only). 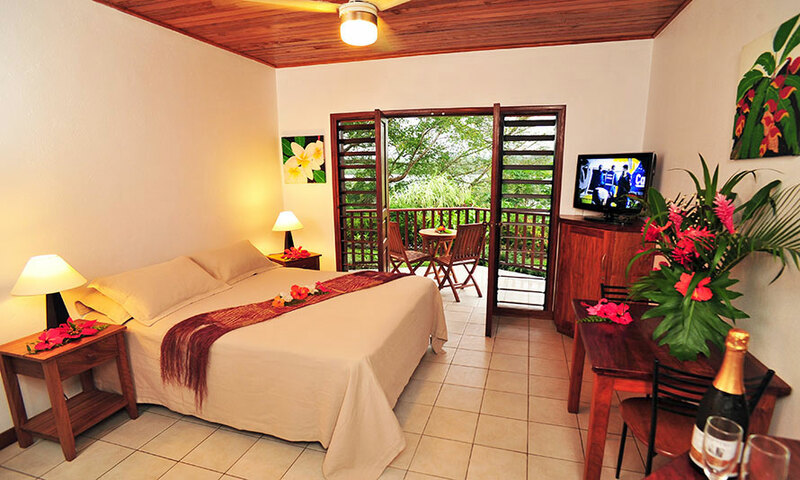 This suite offers spacious apartment style accommodation with beautiful views over the pool and Erakor Lagoon. 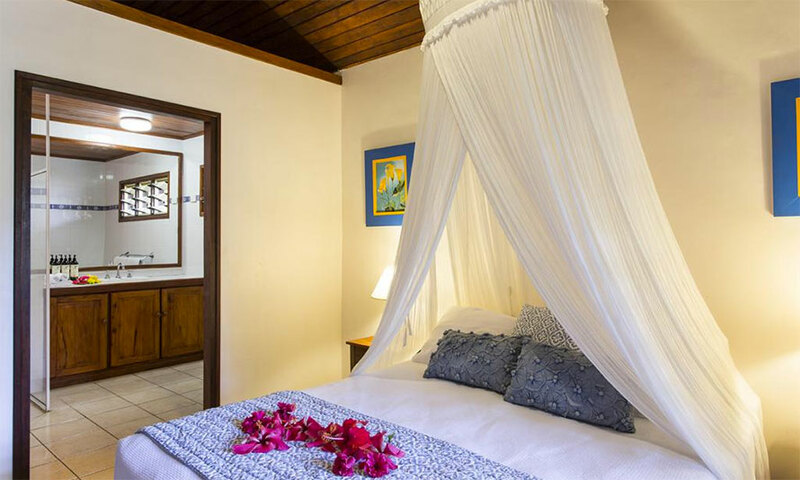 The suites are furnished with charming tropical décor and are ideally suited to families or couples travelling together. Set within lush tropical gardens on the shores of Erakor Lagoon, Poppy’s on the Lagoon is the Vanuatu escape you’ve been dreaming of. Ideally suited to couples and families, the award-winning boutique resort has been named in the Holiday with Kids Top 10 South Pacific Resorts for the 2nd year running. Relax in one of the three swimming pools, kick back at the poolside bar, or feast at the onsite restaurant. Nestled among tropical gardens only 15 minutes walk from the Port Vila town centre, Poppy’s on the Lagoon is designed to take advantage of the cooling breeze of the South Pacific trade winds. Vanuatu Cultural Centre and National Museum is five minutes walk away, while the beautiful Mele Cascades are a short 10km drive. Today you will depart from Brisbane, *Melbourne or *Sydney flying Air Vanuatu, Virgin Australia or codeshare partners. On arrival, please make your own way to the resort. Alternatively, you can upgrade to the return airport transfers package to be met by a hotel representative and transferred to your beautiful island accommodation. This morning, wake up in paradise. After breakfast, take the time to familiarise yourself with your surroundings. The day is yours to enjoy either relaxing by the pool or lagoon, lapping up the beautiful rays of sun as you snorkel around. If you’re feeling adventurous, take the opportunity to join in the many activities available at the resort (not included) or hire a car to explore. This morning after breakfast, make your own way to Bauerfield International Airport for your flight back home. If you have purchased the upgrade option within this deal, you will be transferred by a hotel representative at a scheduled time to ensure you have ample time between your last farewell at the resort and the scheduled flight back home. Travel offer is valid for travel on selected dates until the 19th March 2020. This travel offer is priced for 2 or 4 people depending on which option chosen. Days with * incur a flight high season surcharge of $500 per person. *Melbourne and Sydney: $50 AUD per person. Air Vanuatu, Virgin Australia and codeshare partners. $44 AUD return per person. Please note - Infants (0 - 1) are Free Of Charge for this service. Please select this upgrade at checkout. - Infants 0 – 1 stay free of charge at the property, sharing existing bedding with parents and do not count towards the maximum room capacity.. Please note; additional flight charges may be applicable. - 1 x Cot permitted, FOC (subject to availability). - Children are classed as 2 – 11 years old. Vanuatu has a beautiful tropical climate, the weather is like paradise all year round. Year-round water temperatures sit at a mild 22°C to 28°C, so no matter when you plan your visit, swimming is always enjoyable especially with their crystal blue lagoon water. Choosing the best time to visit Vanuatu is really a personal preference, either way - you're in for a treat no matter what time of year you book your escape, it’s a WIN WIN!